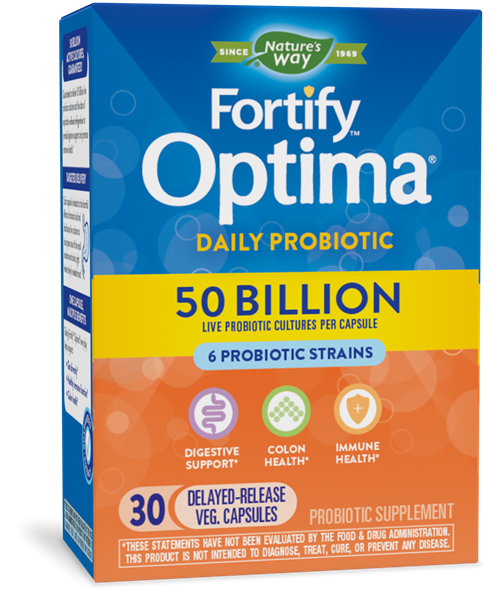 Fortify™ Optima® Digestive Balance 50 Billion Probiotic - Nature's Way®. Primadophilus Optima Digestive Balance contains 100% HDS Probiotics (human digestive strains). HDS Probiotics are probiotic strains that were originally isolated from the natural human intestinal microbiota as opposed to being isolated from animals, plants, dairy or soil sources. Today these strains are grown and fermented in a controlled environment by some of the most respected probiotic producers in the world. The probiotic potency (CFUs) claimed on the label is guaranteed until expiration, not at time of manufacture like some probiotic products. Made with delayed-release capsules that resist stomach acid better than standard capsules to help probiotics survive stomach acid so they are delivered to the intestine where they are needed most. Take 1 capsule daily. May be taken at any time, with or without food. If taking any medications, consult a healthcare professional before use. Bl-04® and Bi-07® are trademarks of DuPont. In the USA, NCFM® is a trademark of the North Carolina Agricultural Foundation, Inc. NCFM®, Bl-04®, Bi-07® are used under license. Probiotic capsules for all ages with 35 billion CFUs & 14 strains of bacteria.